An example of a youth interview from the lds.org image library. I'm pretty sure I wouldn't sit quite so close. A recent article on Doves and Serpents discussed sexually invasive interviews between Priesthood leaders and minors in the LDS church. The potential for abuse in interview situations has long been a concern of mine and as I've blogged about before, I have been a victim of such an interview myself. I wasn't in what I would class a vulnerable group, just a naive new member, but the potential for abuse was still there. Within the LDS church there exists the potential for a wonderful support structure for teenagers with the right Young Women and Young Men's leaders in place. Being a teenager is hard at the best of times, and love and guidance from dedicated leaders can certainly help during those times. However, it only takes a solitary leader, with a "little authority, as they suppose" to exercise unrighteous dominion and give a badly prepared or creepy interview. This interview situation is not the time to develop a relationship with the YM or YW. Those opportunities exist outside of interviews during church activities and lessons. If the only time the YM/YW sees you is in a semi-annual interview, you're doing something wrong. Seek parental consent whenever possible. In many circumstances, especially with younger youth, it may also be appropriate to invite the parent to attend the interview as well if the parent and child are in agreement. Make sure that you are visible to people outside the office during the interview. The bishop's office in our building has a window in the door and my desk is angled in such a way that I can always be seen. Possibly also keep the door ajar, this can be less intimidating to the interviewee and adds reassurance for the parents if not present. If you feel the need to give a worthiness interview, stick to the Temple Recommend questions and don't deviate from them. Also, not all questions may be suitable for all age groups. I've never felt it appropriate to ask a 12 year-old young woman if she keeps the law of chastity. Don't ever, ever probe for a confession to something. Confessions are voluntary and if your questioning is probing in the hope of them "spilling" something, I find that inappropriate and I would frankly class that as child abuse. Don't think you are the only person to resolve any issues that the YM/YW might raise. They are probably more likely to share a concern with a parent or youth leader. Trust that those people help them. I let the YM/YW know that my door is always open if they have an issue they want to discuss and I stand ready to help, but that they shouldn't feel obliged to if they would rather share it with their parent or youth leader. Teach doctrine, not your opinion. Get the youth to interview you. It is sometimes more insightful for both of us if I answer their questions rather than them answering mine. Elder Bednar has taught that "sequence is instructive." Resist the temptation to straight out ask a YM or YW, especially the younger ones, if they are preparing to serve a mission. Before they can serve a mission they need to know the doctrine, gain a testimony and be worthy to attend the temple. So ask how they are doing in seminary and how they are progressing with their Personal Progress/Duty to God awards etc. and teach how those things are important. Interviews should be fun. Keep them as light hearted as possible. It is intimidating enough to be sat in front of a big desk with a suited man without it feeling like a grilling by the FBI. Remember the interview could very well be around the YM/YW's birthday, so don't make them associate their birthday with a grilling from their bishop. Beyond this, the youth need to be taught what to expect from their interviews with the bishopric. Most importantly they need to be told what to do if they feel the questioning is becoming inappropriate (i.e. leave and tell someone you trust). I think we need to somehow address the power dynamic at play here. In a culture that teaches our youth to defer to authority, how can we teach them, especially the young women, to assert themselves when placed in inappropriate interview situations? In addition to this, bishopric members need the fear of God put into them regarding the consequences of them overstepping the mark when they are interviewing. One of the first posts I ever wrote for MMM was about being called as the ward librarian. As I mentioned in that post, my testimony was nurtured by the books that I found in the various meetinghouse libraries throughout my mission. I was disappointed to learn that not all libraries had troves of incredible church books. Then, when I got my calling as librarian, I was even more disappointed to learn I'd be in charge of a 'materials center.' 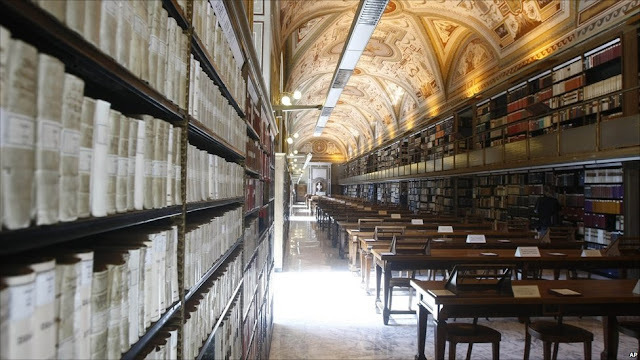 How can you be a librarian without a library? I didn't know this, but they weren't always called materials centers. I recently came across this talk by Howard W. Hunter in 1971 where he introduces a new (correlated?) church library program. From what I can tell, not all meetinghouses has been built with a library, but from then on they were. Then somewhere along the line someone felt guilty about calling a room without books a library and the name was changed to Materials Center. But one thing stood to me out from Pres. Hunter's talk. He said, "If we are to teach one another, if we are to seek wisdom and learning by study and by faith, we must organize and prepare every needful thing. These words form the basis upon which the idea of the meetinghouse library is conceived—to 'prepare every needful thing' for more effective teaching." It seems to me that preparing every needful thing goes beyond having some chalk and a map for your lesson. How much more riveting would Sunday School be if your teacher could check out a copy of any of Skousen's Book of Mormon tomes? Or bring to class the library's copy of Rough Stone Rolling by Bushman? Or quote from the dog-eared copy of Givens' By the Hand of Mormon ? Or use the library's laptop and projector to hit the Joseph Smith Papers website? Lets think even bigger. Could the heartbreaking story of Han Mattsson have been different if his ward's library was actually a library with decent church books? What about all the people that go to the web to find some supplement for their lesson and are crushed when they come across polygamy or the priesthood ban or Mountain Meadows for the first time? Would the story be different if they first encountered those concepts at church? So here's my humble proposal. Let's get rid of answer four and bullet point six and get some good, high-quality books in our libraries. Let's also get some good, high-quality brothers and sisters to staff the library. Brothers and sisters who know church history and love teaching it. Let's turn our libraries into more than a room that dispenses unnecessary coloring pages for primary kids. Let's turn our libraries into libraries. Members of the Church of Jesus Christ of Latter-day Saints call them "talks," but most people call them sermons. This is a series of sermons that many Latter-day Saints love and believe. I hope these sermons promote and perfect your faith as they do mine. Read previous MMM Sermons or watch this specific sermon. I remember growing up with a Mormon friend. He was the only Mormon friend I had that I knew of. I hated spending the night at his house because he didn't have any Coke in the fridge and his family only ate wheat bread, which was an abomination in my home. But, despite the non-Coke, non-white bread home, his home was peaceful and clean and terrifically white. I always remember a large amount of sunlight coming through the windows and bathing the inner rooms and hallways. Further, I remember a poem on the wall of my friend's room. It had the words, of course, but behind the text was a beach scene: a sunrise rising over the waves and an unblemished beach save one set of footprints in the sand. All the years of visiting my friend and staying the night at his house, I never once read that poem. I remember the picture but not one word of it passed by my eyes. It wasn't until much later, after having joined the Church of Jesus Christ of Latter-day Saints and becoming a Mormon myself that I finally read my friend's poem known as "Footprints." For each scene, he noticed two sets of footprints in the sand; one belonging to him, and the other to the Lord. When the last scene of his life flashed before him, he looked back at the footprints in the sand. He noticed that many times along the path of his life there was only one set of footprints. "Lord, you said that once I decided to follow you, you'd walk with me all the way. 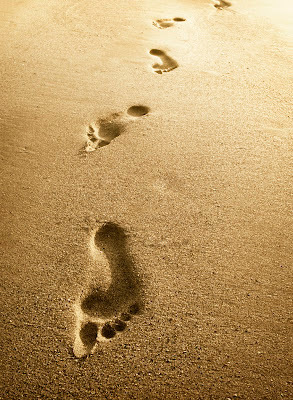 But I have noticed that during the most troublesome times in my life, there is only one set of footprints. I don't understand why when I needed you most you would leave me." The Lord replied, "My precious, precious child, I love you and I would never leave you. During your times of trial and suffering, when you see only one set of footprints, it was then that I carried you. Knowing that I had seen this poem for a decade and not read it, I was overwhelmed by its powerful message. In simple terms, this poem by Mary Stevenson touched my soul. But, beyond that generic yet true phrase, I felt an inner understanding that I had searched for my whole life. Why had I survived so many horrors of my youth and could still smile and still feel peace? How could I forgive those who had abused, harmed, or even tried to murder me? How could I be merciful to those who were so unmerciful to me? My answer lay in this poem's explanation: It was Christ who carried me through the trials of life, not because I merited such service but because he showed me mercy. I was not a Christian as a youth. Far from it. In fact, I was a hedonist and grew-up in a hedonistic household. There was very little that was godly in my home, that praised God, that reinforced His commandments. 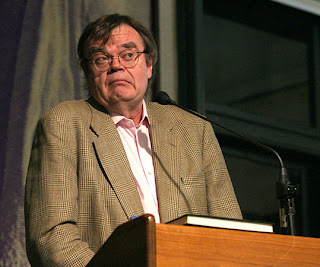 So says Garrison Keillor of the Prairie Home Companion radio show. Maybe, like other things in life, if you get too much happiness you become unbalanced. 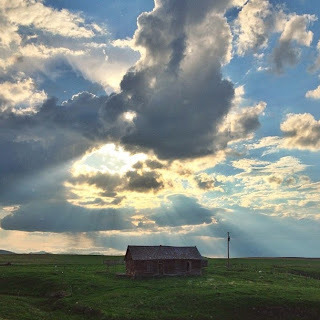 In my experience with lessons at church it seems we occasionally claim that life is easy if you are LDS with a clear plan of happiness and an iron rod to hold on to. But in other lessons we extol the virtue of overcoming trials that are an essential part of life, and maybe as peculiar people we have more than our fair share. Sometimes we preach that God blesses his faithful children, other times we preach that where much is given, much is required - including challenges that may not be fun to overcome. Is it just me or do we have a dichotomous view on happiness and how often we should expect it? Regardless, I enjoyed Garrison's light hearted take on the subject of happiness in an episode of Lake Wobegon that I recently listened to. "They (Garrison's relatives) were very happy in Pasadena. They talked about this when they came back. And happiness made them tedious, as it always does." "Happiness is narcissistic essentially, isn't it. It's sort of infantile." "Happiness makes you unhappy ... in the end." 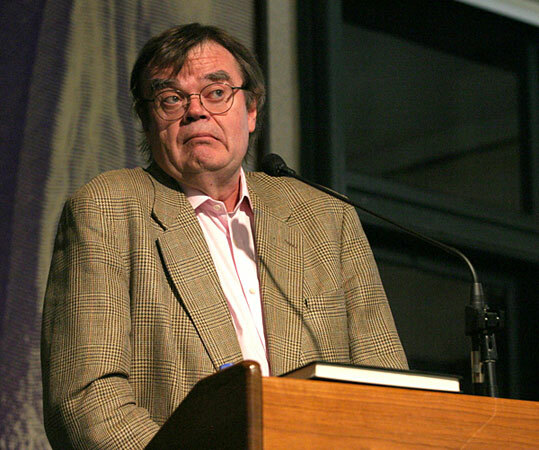 But as a general rule you shouldn't read Garrison Keillor, you should listen to the masterful story teller. The player below should skip to the Lake Wobegon segment at 81:35 when you click the play button. First time listening to Garrison? You're welcome. Several books about the little-known, little-understood history of black Latter-day Saints have hit bookstores and e-readers this year, including two revised volumes of Margaret Young and Darius Gray's Standing on the Promises novel series (published by Zarahemla books) and W. Kesler Jackson's Elijah Abel: The Life and Times of a Black Priesthood Holder (published by Cedar Fort). Scott Hales: For those who don't know, who was Elijah Ables? What makes him an important figure in Church history? Russell Stevenson: In some ways, this is the question. That he existed at all forces the Mormon people to revisit—and probably overturn—their assumptions about Mormonism's racial narrative. Elijah Ables was an African-American man born in western Maryland. Census numbers suggest that he was a slave at one point, though we can't be certain of that. As a young man, he left Maryland and made his way to the river city of Cincinnati where he came into contact with Mormonism. He joined the Mormons in September of 1832 and went to Kirtland in 1836 where he was ordained an Elder. Later documentation suggests that he was ordained "under the hand of Joseph the Martyr" (Eunice Kinney, Letter to Wingfield Watson, July 5, 1885). He served a mission to Canada, lived in Nauvoo, served a prolonged mission in Cincinnati where was later ordained to be a Seventy. Ables was one of the highest ranking leaders in the branch. Ables came to Utah in 1853 and stayed committed to the faith for the remainder of his life. 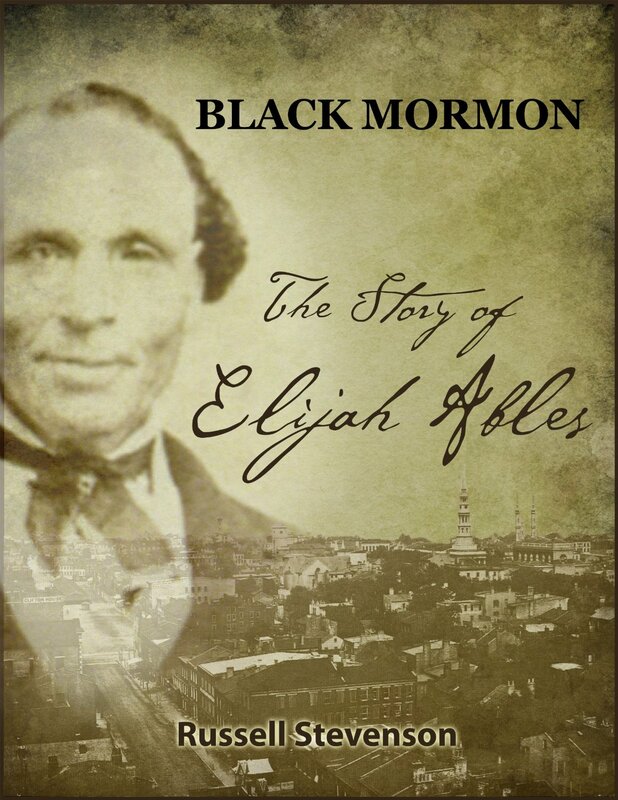 SH: Generally, in Church histories, Elijah Ables is known as Elijah Abel. Why favor this less common variation of his name? RS: This is perhaps the most commonly-asked question. The short answer is that "Ables" is the earliest documentary evidence of a signature (from a letter to Brigham Young) that can be credibly traced to Elijah's own person. There is later evidence—an invoice—that suggests an "Able" spelling. However, his name was spelled in every conceivable way in the nineteenth-century: Able, Ables, Abel, and Abels. SH: What does Black Mormon reveal about Elijah Ables that other studies of his life do not? How does your research change what we know about the man and his work? RS: The few works there have been on Elijah's life have been very "Mo-centric," relying exclusively on Mormon sources and placing him within a Mormon context. But no one has ever been so one-dimensional. 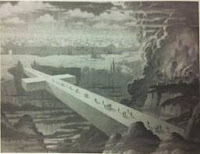 My work suggests that Elijah was a socially agile figure--capable of navigating a number of contexts. Whether he lived in the urban black community of East Cincinnati, the runaway slave population of Upper Canada, or the heavily Yankee scene of northern Ohio, Ables had to work with a wide variety of social networks, each with distinctive values and cultural systems. There are government documents and contemporary correspondence illustrating how Elijah Ables helped the Saints escape a rebellion in Upper Canada. Some of the earlier works do not address Elijah's commitment to upholding the institutional church, even when he was clashing with some of its highest leaders. Seattle Jon lives a few blocks from one of the few Deseret Industries outside of Utah. With fewer members around to pick over church books, he is constantly buying ... sometimes without realizing he already owns what he's buying. For this giveaway, he is again dipping into his private collection to send the winner below the following gently used church books. Please respond via email with your address by Friday, August 30th to claim the books. 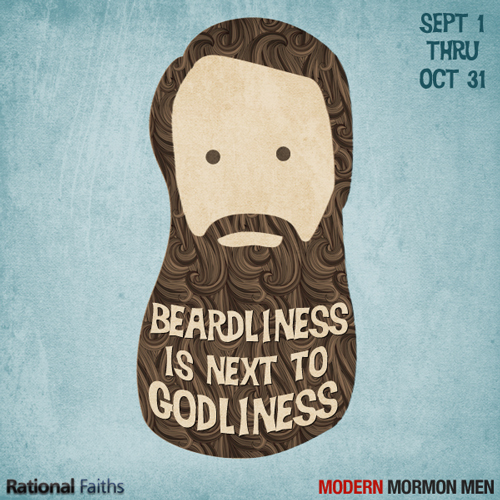 Rational Faiths and Modern Mormon Men are launching the contest to end all contests, starting this September 1st and continuing until the end of October. Before we begin, think about what we know about our Heavenly Father. We know he is all-powerful and all-knowing. We know he loves us. From prophetic accounts and artistic depictions, we also know he has a beard, and we know he sent his bearded son to die for us. In other words, beardliness is next to godliness. We are sure this has been something prophets throughout time have struggled with. Some may have wanted to emulate our heavenly guides by growing beards. Some perhaps have felt unworthy and decided to make a subdued effort, decorating only regions of their face with facial hair, thus attempting to show their humility before God. Some have completely shaved their face, maybe to delineate the separation between man and his creator. The collection of various attempts has left us with quite the gallery. Take a picture on the first day, and if possible include evidence to indicate the date - i.e. a date display on the picture, a newspaper from September 1st in prominent display, etc. Submit via email a final picture and a name for the style - "The Wilford Woodruff," "The George Albert Smith," "The Early Lorenzo Snow with Awesome Sideburns," "The Older Pointy Bearded Lorenzo Snow," or "The Heber C. Kimball Comb-Over Sideburns Combo"
Prizes for both those that start with a smooth face and those that start with a beard. We'll post the final pictures, with the winners being decided by the number of votes received. The smooth-faced person with the most votes will be awarded $100 in cash, a Sunday School or Illustrated Mormons print from Scott Heffernan, and a Rational Faiths sticker. The person who starts with a beard will be awarded the same but only $50 in cash. That's some good prizes to look totally awesome and be the envy of all of your friends! The more who participate, the more fun we will have. Let the beard growing begin! We are a church of councilors, or counselors, or people affected by counseling with councils. I have served as a counselor in a bishopric, a high councilor, and currently in a position with two great counselors. I council with my family, with the ward council, work with a group of students called a service council which is located next to the counseling center on campus, and try to avoid situations requiring a disciplinary council or a marriage counselor. In his book Counseling With Our Councils , Elder M. Russell Ballard encourages those with a sincere desire to lead organizations in spiritual and temporal purposes to "make sure you look for people who are strong where you feel you are weak." Luckily that doesn't eliminate many people from consideration, as we all have weaknesses. We know that leadership opportunities provide us with a plethora of learning experiences, but many come from interactions from those we serve with in a leadership council, presidency, or group. This week I have undergone one of the transitions in leadership change that has caused me to reflect and appreciate counselors. Our presidency group is diverse, very diverse. We range in age from 40-80 years old, in height from 6'5" to 5'5", have a strong left wing democrat, a staunch right wing tea partier, and very different occupational and educational backgrounds. However, it has been one of the most unified groups in purpose I have been part of. We are not devoid of individual imperfections, but collectively have been a strong group. 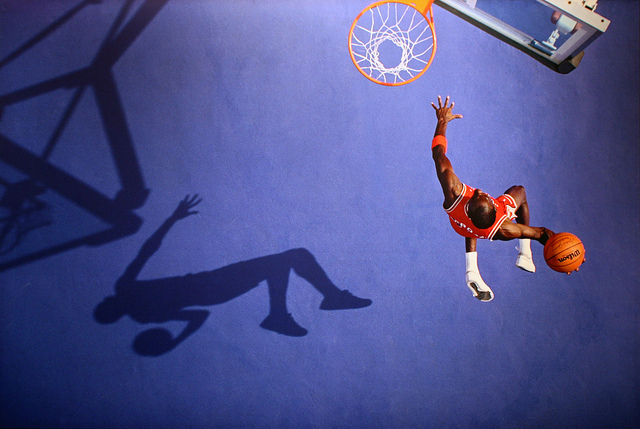 But as I write this and reflect, I realize the impact has not been in group performance, but in my individual growth. I have needed these men to support me, to correct me, and to teach me. I lost my father at a young age, and am acutely aware of male role model examples. From each of the group I have learned, been loved, and patiently been mentored. As my counselor was released this week, I realized he is a hero to me, a teacher for me, and a true friend. It is not the conversations about lessons, policies, and doctrines that I remember from him as much as the discussions on gardening, raising children, insights on people, testimony of the gospel, and love for our country. Every father should be able to learn from a dad like Lyle, every leader should feel the support of a counselor like Lyle, and every friend should learn what loyalty and love are from a friend like Lyle. I am blessed to say I have had this honor. In an imperfect world I am touched and humbled to recognize a perfect gospel exists that allows teaching through so many methods. This allows that when we are in positions to teach and lead, we often are taught and led the most, and especially we are counseled by councils and associations with counselors. I always hated checking out scriptures from the building library at church. You'd get the sets that people had left behind, old seminary copies all marked up, or weird old editions without the 1981 footnotes that I was used to. Finding a verse just felt uncomfortable in those library scriptures; technically the words are the same of course, but they weren't mine. My mom recently tried to buy my son a leather bound triple combination for his upcoming baptism. No luck since the new edition will be coming out soon. I'd completely forgotten about the announcement earlier this year regarding these updated scriptures. I don't know that I'll get a new set of my own, at least for a while. About ten years ago I did, under duress; my baby brother had written his name on my beloved worn brown leather cover scriptures, the set I got when I turned eight. Blue fountain pen, front and back, in unsteady three year old letters. The inside was fine but seeing the monogram finally got to me and I traded them in. The plus side of new scriptures: no markings. Every verse seems new somehow and you can mark what strikes you as meaningful on each particular read through. I swear, there are things I never saw before the first ten times through the Book of Mormon. The down side? I felt like I hadn't read my scriptures before. I had, promise, but it felt a bit cold and impersonal not to have my history there with me in the pages. A few years ago, Deseret Book came out with a family edition of the Book of Mormon. Sadly, it is the same length and doesn't summarize the Isaiah passages which are what a true family edition would do. But the pages are big and shiny, there are pictures, and footnotes have extra explanations. It is lovely to read. My favorite childhood scriptures are a sixteen volume set of oversized blue hardcovers, Illustrated Stories from the Book of Mormon, circa 1971 from Promised Land Publications. They are in between the church illustrated editions, with two or three pages per story, and regular scriptures. I bought 'the blue scriptures,' as I always think of them, on eBay last year. My sister snagged the ones from my parents and my other sister somehow finagled the same ones from her in-laws. It is raining at our house today. It is a gentle rain made up of large friendly droplets that 'smoosh' against the pavement in a nice way. They hit cars and make an engaging rhythm, they fall through the leaves of a nearby tree and run down its branches in gentle rivulets. This inviting scene compels me to step through our front door and onto the porch. I feel a rush of cool air and fight back the urge to strip down, run barefoot up the street, and splash about in the large puddles and streams forming over the pavement. I don't really put any effort into fighting the temptation and it very quickly overwhelms my mind. I start to pull off my shirt and unbutton my pants (don't worry, the entire neighborhood is at church while I stay at home to nurse my sick wife), when a movement catches my eye. Between a couple of cars about fifty yards away, I catch a glimpse of something red moving about. I readjust the focus of my eyes towards the moving object and notice a young girl with a red umbrella dancing about. She holds the umbrella above her head and spins, while her feet tap an unknown rhythm in shallow puddles. I cannot clearly see the details of her face because of the distance, but this is the happy dance of an elated child who understands the joys of playing in the rain. I am certain she does not know that I am watching her, but I doubt it would matter. She is so consumed with her joy at finding a perfect childhood moment that nothing else matters. I am entranced by the scene, and after a few more minutes of watching her spin like she's imitating Gene Kelly, I realize that I am smiling broadly and laughing quietly. So, I decided to summarize the Book of Mormon. Let me start out with a disclaimer: the purpose of this video was not to present a balanced overview of the Book of Mormon as a whole. Rather, I wanted to demonstrate that many of these Book of Mormon "greatest hits" we often recite have pretty disturbing subtexts, and we should be more mindful of that. Sure, the story of Nephi emphasizes the importance of obedience and faith. But what about the "it's ok to kill people when God tells you to" message it also carries? Or the "using violence against the enemies of the savages to impress them is a great missionary tool" kinda feeling in the story of Ammon? Or the "making sure sinners go to hell is more important to God than saving the lives of the innocent" vibe in the adventures of Alma and Amulek? Honestly, I like the Book of Mormon. I do. I think it has a great story arc (birth and death of a nation, etc. ), some fascinating characters (I mean, Amalikiah? Dissenter who becomes king of the archenemy? That's straight up Shakespearian! ), and is pretty theologically rich (2nd Nephi 2's interpretation of the Adam and Eve narrative seems particularly forward-thinking). But I wonder—are the Book of Mormon stories we commonly repeat to children and new converts and investigators really promoting the values we think they are? And if not, how should we approach them differently? Seattle Jon lives a few blocks from one of the few Deseret Industries outside of Utah. With fewer members around to pick over church books, he is constantly buying ... sometimes without realizing he already owns what he's buying. For this giveaway, he is again dipping into his private collection to offer the following gently used church books to one lucky winner. You have THREE chances to enter. Each entry requires a separate comment. 2. Like MMM on Facebook or share this post on Facebook. Leave a comment letting us know you did. 3. Follow MMM on Twitter or share this post on Twitter. Leave a comment letting us know you did. • 6 days to enter (closes Sunday, August 25th at midnight). • Winner announced Monday, August 26th. • Winner must respond via email with their address by Friday, August 30th to claim the books. • Books will be mailed at our cost if within the United States. The following is an anonymous guest post in what will be a three-part series on disfellowshipment. Submit your own guest post via email. Read Part 1 and Part 2. 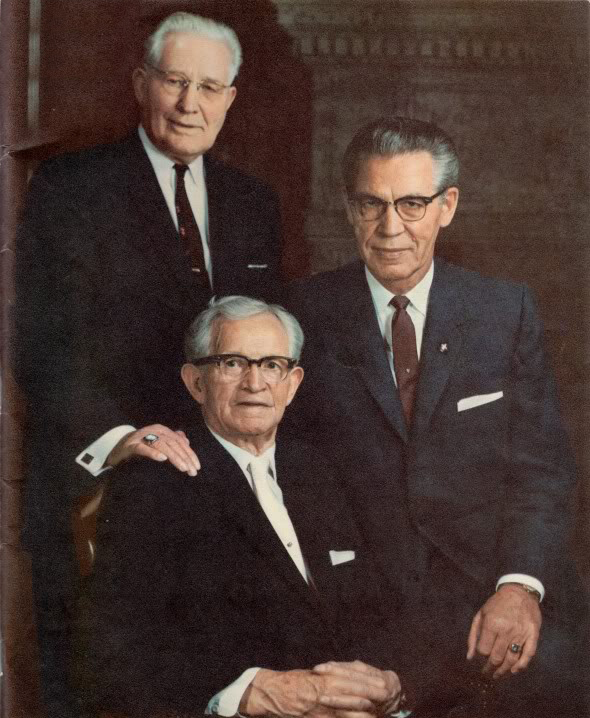 My last meeting was in an office with all the same Brethren who were there one year prior. The Bishop reviewed the steps I had taken and the progress I had made. They concluded that I had done my part and that I was now re-fellowshipped, so to speak. I walked out feeling light. I was so happy. After getting in my Jeep, my feelings were completely opposite of the previous year. I felt light, full, and clear. I prayed and thanked Heavenly Father for the strength I was given and for my new-found strong testimony. After letting those close to me know, I went to the temple a few days later, alone, to reflect on my progress and get a greater vision of the eternal progress I still had in front of me. I didn't go in with any questions or seeking revelation, but just to thank Him for all that He had done for me and especially for the Atonement of Jesus Christ. I now have a stronger testimony in the power of the Atonement. I relied on it every day during that year and have greater faith in its power. I have developed good and healthy habits that will forever keep me away from temptation, not all of it, obviously, but I am now more prepared to shake it off. Mine are more gray and yellow and see through. Get those white undershirts. Celestial Smile. They are rare. But they are special. I saw this blog post, Letter to my daughter after watching 'The Bachelor', making the rounds a few weeks ago. A friend sent it to me saying that they could see me writing this to my daughter. And of course, I totally would. But someone else has already done the hard work so I'll just show it to her instead. If you are unaware of The Bachelor/Bachelorette phenomenon, here's the quick version: A group of guys/girls all get together in a large house to compete to fall in love with a single guy/girl. As the show progresses, the guy/girl searching for love on TV eliminates contestants, whittling down the group until there are only two remaining and they must then choose who they want to marry. Awesome, right? Now I totally agree with everything that is said in the post about The Bachelor, and there are some seriously wrong messages that this show is teaching to both boys and girls. However, I think there are some valuable lessons that any guy can be learn by watching the show. And believe me when I say this: I watch The Bachelorette so you don't have to. So, after my extensive "research" into this subject, I give you: How to Get a Girl to Fall in Love With You According to The Bachelorette. These are a must. It is clear from watching the bros on the current season of The Bachelorette, that a v-neck is a necessity to any bro's wardrobe. The best part is, you can never own too many v-necks. And you know how some women can be concerned that they might show up to a party ... err ... an FHE, and hope she isn't wearing the same dress or blouse as another woman? Well, while this may not be as big of a concern for a lot of guys, you DEFINITELY don't have to worry about it when it comes to v-necks. Awhile back, heaven was frequently on my mind. How you get there, what it looks like and who's there. Problem is, the more I thought and studied, the less sure I was that any non-speculative answers existed. Which is why I was so excited when I read Rob Bell's Love Wins . His description of heaven (and hell) I could get behind. In Chapter 2, Bell talks about a piece of art that hung in his grandmother's house. The massive cross was suspended in space, floating above an ominous red and black realm that threatened to swallow up whoever took a wrong step. There was a gleaming, bright city with a wall around it and lots of sunshine. Inside the city he was sure there were people dressed in white robes playing harps while walking on streets of gold. Us mormons might not have the exact same picture in our heads, but we too have cultural images of heaven crafted by decades of general conference talks. What will we do all day in heaven? Will we be with our family and friends? What will heaven look like? Will I lose my spare tire and get all my hair back? And some of us aren't very motivated by the answers. Which is sad. On Sunday (August 4th) I substituted for Gospel Doctrine. Since the lesson was Lesson 31: "Sealed … for Time and for All Eternity," and it treated Section 132, I decided to address plural marriage as a very important element for the section's context. Or, in other words, I deliberately had a Gospel Doctrine lesson dealing with plural marriage. This post is divided into these sections: Why would I do this? How I planned on doing it? What seemed to be the results? Part of my desire to do this was as a direct response to the recent New York Times article. It broke my heart to hear about faithful, wonderful members who found confusion and distress over this and other controversial topics. I'm not sure what I think about accusations of "whitewashing" LDS history, but I thought that this is at least a way to bring this out in the open. So my thinking was that addressing plural marriage on Sunday in Gospel Doctrine might be appropriate. Another reasons for doing this: I have been thinking a lot about this topic as I have been answering questions that come up in Institute. Also, it just plain interests me. Finally, I would say that the goal was to help those in my ward (here in North Carolina, where the members are pretty generic, Wonderful Mormons) see that we can talk about potentially controversial topics in ways that are calm, clear, and ultimately faith-building. I hoped that it would give them new tools to explore the topic, new skills to teach their children, and greater confidence to discuss this topic openly with one another and with those not of our faith. I will also say that I have been thinking and stressing about this all week. Just before the lesson started, the missionaries told me that this would be an investigator's first Gospel Doctrine class. That made me seriously reconsider. How I planned on doing it? 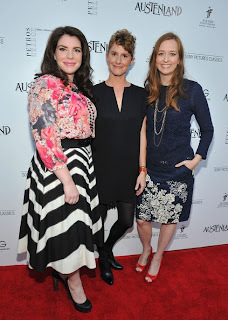 Why You Should Care About "Austenland"
It is a truth universally acknowledged that most Mormon girls swooned over the wet-shirt version of Pride and Prejudice, and it changed the concept of romance for us all. This is why we keep going back to other, lesser period romances and Jane Austen fan fiction, but luckily Shannon Hale stepped in with Austenland. Which is going to be released as a movie. Like, now. Excuse me while I go geek out about this for a few minutes. There is so much history behind this for me. Fast-forward to 2008, where I bought a book by someone named Shannon Hale who delivered a premise I couldn't ignore: a heroine basically goes to a Jane Austen theme park and lives out the Colin-Firth-in-a-wet-shirt fantasy she had probably nurtured with her own set of bulky pink VHS tapes. At a sleepover. In 1998. Bronco Mendenhall a Fan of MMM! We knew Bronco read the blog, but we didn't realize he was such a big fan. 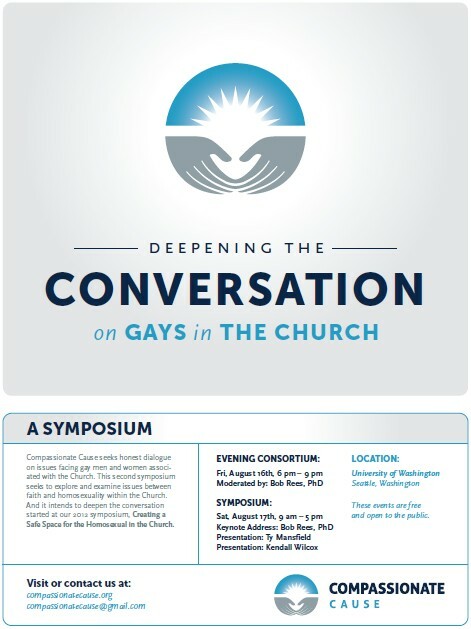 The second annual Compassionate Cause Symposium, Deepening the Conversation on Gays in the Church, is scheduled to be held on August 16-17, 2013 at the University of Washington Campus in Seattle, Washington. Ty Mansfield, Bob Rees and Kendall Wilcox will be featured speakers. Please join us for a spirited discussion advancing compassion, understanding and Christ-like charity toward homosexual members, as well as their family, friends, ward and stake leaders and fellow members. Want to attend? Click here to register. Note that admission is free, but we want to have an accurate count of attendees to ensure that we have adequate space to accommodate all attendees. If you would like to make a donation to ensure that the symposium continues to be admission free, click here to donate. You can also find out more about the symposium on our Facebook event page. We look forward to seeing you and your friends at the symposium. I seem to spend an inordinate amount of time in Walmart. One time I made the mistake of wearing tan pants and a dark blue shirt. After the fourth person asked me where something was, I realized that I looked like an employee. I also realized that I know where every darn thing is in that Death Star sized store. I have devised a little thought experiment that I like to use in Walmart. For a moment I take seriously the idea that anyone, everyone, could, someday, be a Heavenly Father or Heavenly Mother. I imagine that the person pushing a cart in front of me or trying to find a peach without a bruise or pulling the 25¢ coupon for the Greek yogurt out of a pocket is in one specific moment of her or his eternal journey. I try to imagine what this moment might mean. Could this be that early childhood stage, before the parent's divorce and all of the challenges and growth that that event brought? Is this a quiet, lonely stage, the stage where so many loved ones are gone and the weight of being alone forges part of that person's essential empathy? 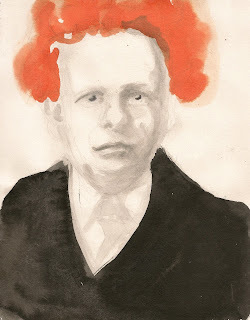 Today, I saw a man whose hair was thinning on top. Apparently the hair on the sides of his head had decided to compensate for their lost follicle brothers, and let me tell you they were doing quite the job. It didn't look like clown hair, but it was getting there. So I thought that this man may very well, someday, be a Heavenly Father, and just the thought seemed to endow him with a hint of an eventual divinity. And since I associate laughter (the good, full-hearted, eternity-shaking laughter of love and home) with God, I imagined this man creating a world with rounded trees having full branches on the side and little on top. I imagined him doing this as an homage or a little inside joke about his time on Earth. It doesn't matter if you're man or woman, gay or straight, dark- or light-skinned. 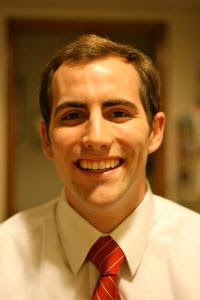 All can equally submit guest posts to Modern Mormon Men. Write something now and submit via email. Jessie B is a 20-something wannabe-super-homemaker with a modern mormon husband and an obsession with blog stalking. Her post started as a personal reply to this post from Eliana, but turned into something longer than expected. I can't remember how many times we prayed that my brother John would stop having seizures; I grew up learning to ask for that as often as I asked for a blessing on the food. Temple prayer rolls, family prayers, all of it. 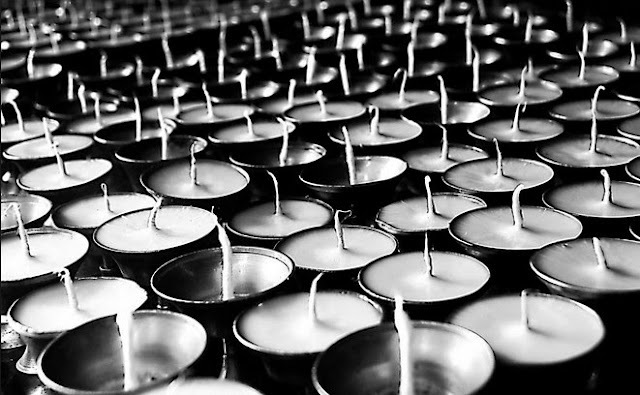 What did I learn about the power of collective prayer? For years, nothing. He did not get better. The seizures did not stop. All of our lives were shaped around his epilepsy in some way or another, my mother's most of all. He was about 25 when the seizures stopped, for no apparent reason. Mom's prayers and temple attendance had been consistent for 20 years; she didn't suddenly start submitting his name to the temple and it isn't as though he has some game-changing priesthood blessing that finally worked. Why so long of collective prayers, especially the temple prayer roll, where you would assume a prayer would have the most power? I don't know, but I do know it gave Mom solace when she went to the temple to know that when she brought her son's problems to the Lord's altar, He was listening, and He could offer unrestrained comfort and inspiration in His own house as He could nowhere else. But still, why the collective prayers at home, and the fasts, that went unanswered for two decades, then were answered by the silent climax that one day, John simply woke up and had no more seizures? Not because they were more powerful, as a prayer, but because when we all prayed for him, it was an expression of empathy, and when we were earnest about those prayers, we were thinking about John, and about ways we could help him. And very often, the constant prayers added up to tiny miracles like the doctor that drove out in the snow on Christmas Eve to deliver John's medications to us so that he could enjoy Christmas with the rest of us. Our doctor knew how much we were praying for John, and I think he knew he could be the answer to one of our collective prayers that night. Although I'm a practicing, believing member of The Church of Jesus Christ of Latter-day Saints, I'm a firm believer in being familiar with other religions. 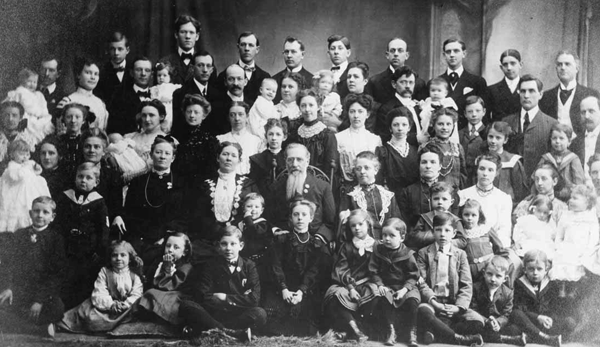 When we lived in Bountiful, Utah, a couple times a year the LDS ward choir would get together with the Lutheran choir to present musical numbers in each other's worship services. I loved that, especially at Christmastime. When we were in Henderson, Nevada, we attended an annual celebration of Dr. Martin Luther King where the pastor recited his I Have a Dream speech. It was always powerful and moving. When I was a teenager, my parents would occasionally take us to the Catholic's midnight mass, a Christmas tradition carried over from my dad's family (he was raised Catholic). I've been to a number of different faith's worship services. I love the music and spirit present in many of them. Believer or non-believer, one thing's for sure: We're all perfectly loved by a Heavenly Father who wants nothing more than our individual and collective joy. 1 – If you want to understand another religion, talk with its believers, not its enemies. Melissa Dalton-Bradford is a mother, wife, sister, daughter, friend, writer, independent scholar, professional soprano, avid reader, and a serious avoider of all things mathematical. She is also the author of GLOBAL MOM, an intimate and colorfully-narrated peek inside the life of a family of four traversing across eight countries, 16 addresses, and five languages. Buy Melissa's book here. Recently, I stood in a circle of dear friends. We were maybe sixty active LDS, all gathered to hike in what many consider to be Zion's gravitational center, Utah's Rocky Mountains. While we went around the circle sharing who we were and where we were from, I counted six languages and even more countries of current residence. It was a big globally mobile round, a round that is emblematic of my family’s life for over twenty years, a life spent, some might think, on the farthest edges of the Church's geography. A life, however, planted squarely and deeply in the heart of the restored gospel. My husband Randall and I have spent over two decades raising our four children in eight locations some might consider to be the nethermost edges of the Church's geographic sphere: Hong Kong, the New York City/New Jersey area, Oslo, Versailles, Paris, Munich, Singapore and Geneva. However "remote" those locations perhaps seem to be with respect to our Church's solar system, we haven't felt flung into oblivion. On the contrary. We've always been drawn into a circle of awaiting members, locals who have taught us their languages and how taught us how to parallel park in an impossibly narrow one-way and how to bow to our elders and pick a decent truffle and eat raw shrimp and play the alphorn. How to run in stilettos on cobblestones. How to kayak, snowshoe, catch a gecko bare-handed or how to ice fish at night. And how to live our shared religion within the context of their culture’s peculiar norms and traditions. We've done this global thing deliberately. It is all our children know. We don't foresee it changing. And though such a lifestyle comes with some high personal costs, I consider the demands and sacrifices worth the gifts of exposure, solidarity and spiritual solidity. Along with living in the countries I noted above, we've been able to crisscross continents, visiting and worshiping with LDS congregations in their chapels and temples. Warsaw, Poland. Arusha, Tanzania. St. Petersburg, Russia. Cebu, Philippines. Istanbul, Turkey. Bali, Indonesia. We've sung Silent Night in Swahili, He is Risen in Polish, and Come, Come Ye Saints in Italian, Swedish, Tagalong, and in (some mumbled desecration of) Cambodian. I recall a particular visit to the temple in The Hague, Netherlands. Randall and I stood in a circle of what seemed like a small United Nations of fellow worshipers (The Hague is, in fact, one of the seats of the U.N.), and everyone in the circle wore headsets through which a dozen different languages were piped. Praying out loud with a circle of several brothers and sisters, each speaking a different tongue, was profoundly moving for me. "This," I thought, "is my family. This is a church I understand. And this is heaven." Another U.N. city is Geneva, Switzerland, our current home. Within our stake, there are French, German, Filipino, Spanish, Italian, Mongolian, Nigerian, Ghanaian, Russian, Chinese, British, American and Swiss members. Dalton and Luc, our two youngest boys still at home, realize that because they speak French, they will have the chance to serve as a bridge between local and expatriate youth. This post was originally published on April 15, 2011. Goodbye un-ruptured Achilles Tendon, you will be missed. Like most Momos I've been having dramatic debates between my mind and body since... oh let's see... about the onset of puberty. It's probably safe to assume that my body was still angry about losing one-too-many of those hormonal arguments during my teenage years and was waiting in the wings for a chance to win a debate in melo-dramatic fashion. Thus begin the chronicles of our hero, (referring to myself in the third person for dramatic effect) hobbling around on crutches and gearing up for a year of grueling rehab. Has anyone else got wrecked in church-activities? Did your cuss-censors hold-up, or were they glitchy like mine? What is the most awkward place you've experienced cuss-censor failure (think Ralphy in A Christmas Story)? World news of late has been filled with natural disasters, war and economic instability. Church leaders are often quick with the reason why - we're living in "an increasingly wicked world." I don't know about you, but I'm not a big fan of my kids thinking the world they live in is becoming increasingly wicked. Why? I don't find it particularly helpful to have them fearful of their future. The people over at Business Insider must feel the same, as they recently put together 31 charts to help restore our faith in humanity. 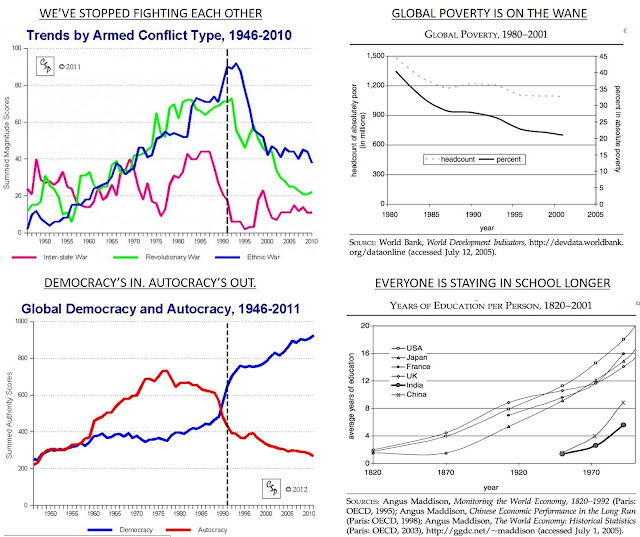 Many of the charts combat what we often hear in the pews about an increasingly wicked world (see them all here). How do you feel when you're told you're living in an increasingly wicked world?